Thus Czerny describes Beethoven at the piano in 1801. With very few exceptions, such a description could hardly apply to todays pianists, the majority of whom (not to mention other instrumentalists) frequently adopt ungainly stage mannerisms. On TV, musicians may be observed seemingly doing their utmost to appear absurd by frequently grimacing or indulging in greatly exaggerated movements. In reality these musicians often remain unaware of their public antics. Have you ever watched such pianists on the TV without the sound? It is quite a revelation. Compare the present days artists with, for instance, Horowitz, who even during the most hair-raising feats of bravura managed to remain absolutely still, a picture of serenity. The same could be said of Heifetz, Cortot, Moiseiwitsch and most of their contemporaries. The great and unforgettable Romanian pianist Clara Haskil, despite a serious curvature of the spine, proved at all times to be a model of tranquillity, even under the most severe physical and mental duress. How many memorable occasions one recalls of the magnificent Youra Guller, sitting regally at the piano, for all the world a goddess in a red Lanvin evening gown, producing the most amazing fortissimos without the least apparent physical effort. Rachmaninov performed miracles whilst remaining as still as a statue. In the case of certain jazz musicians one need only observe Fats Waller in an old film to note how quietly he sat while performing uncanny leaps with his left hand. It is interesting that the Italian harpsichordist Girolamo Diruta wrote as early as the 16th century, ´Unnecessary body movements are to be avoided at the keyboard...´ Couperin writes in his didactic work L´art de toucher le Clavecin about beautiful bearing at the keyboard - though his advice to turn to the audience with a smile whilst playing cannot he taken seriously nowadays and should perhaps be an option left singularly to the wonderful, controversial and wholly unique Australian pianist David Helfgott. While Chopin, Thalberg and company were models of poise and elegance at the keyboard, the very young Liszt must have shocked some of the old guard with an excessive show of gesture and movement. So much so that John Field, at the end of the young prodigy´s recital, turned in mock horror to the person next to him and asked ´Does he also bite?´ Fortunately in later life, Liszt saw fit to pour oil over the troubled waters. The most important point is why the correct posture and bearing at the piano is so essential to the performer. It is no secret that a number of well-known performing musicians suffer from any number of physical ailments, including tendinitis, tennis-elbow, ganglion and, even worse, focal distonia which totally prevents the use of one hand. All these ailments originate from misuse of the body. In a lecture endued ´Is there an ideal way of playing the piano?´, the lecturer, upon showing films of Horowitz, Glenn Gould, Arrau, etc. came to the conclusion that there is no ideal way of playing. Needless to say, I failed to agree and contradicted him, stating, ´Although throughout their lives many pianists may play wrongly without damaging themselves, there are those less fortunate who have to stop playing altogether.´ For instance, Glenn Gould, in spite of his perfect use of hands and arms, sat so low at the keyboard that it resulted in him lifting his shoulders unnaturally, creating back pain and numb fingers and immense tension in his neck. The tension Gould incurred was due to the wrong way of sitting at the keyboard for so many years, and could even have been partly responsible for his untimely death. By contrast, Louis Kentner, who sat almost as low as Gould but used his body correctly, suffered no ill effects and played magnificently well into old age. As a jury member at an international piano competition, I happened to be sitting next to a famous senior French pianist and respected teacher. At one point he turned to me and complained about the exaggerated and unfunctional movements of a particular candidate who was playing. When I remarked that he was complaining about his own pupil and asked why he didn´t tell her about those bad habits, he responded by saying that it was not his duty to correct these physical shortcomings. 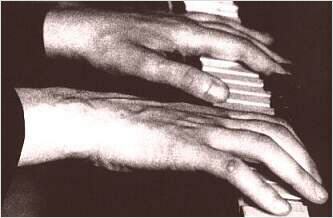 The hands of the great pianist Clara Haskil, showing an ideal positioning of wrist and fingers. But whose duty is it, then, if not the teachers? This reminds me of yet another case, unfortunatly one of many. A colleague, a professor at one of our prestigious music institutions, asked me to look after one of his extremely gifted students whenever he left on concert tours. During one such period I failed to hear from the student for some time. When finally she telephoned me and I asked the reason for her long silence, she confessed to having developed tendinitis. I asked her why she did not contact me immediately as I could have helped her. When I asked her what her teacher had suggested she should do, she replied: ´He told me to either stop playing, or have a cortisone injection, or learn the Bach/Brahms Chaconne or the Ravel Concerto for the Left Hand.´ I told her that should she practise those pieces the left hand could also develop tendinitis. I suggested she see me immediately and within one week her tendinitis was cured completely through the deployment of a special set of exercises I had devised, and by her learning how to release the tension from those parts of her body which she had not been using. I also recommended to her (as I recommend to all my colleagues and students) to read Zen in the Art of Archery by Eugen Herrigel, and the excellent book The Pianist´s Talent by Harold Taylor (Kahn ´ Avenil) to gain more insight into performance problems. There are functional and unfunctional movements which can be better understood through learning the Alexander Technique and the Feldenkreis method, or any one of the martial arts. It is sad, however, that so few teachers pay attention to the correct physical training of the pupil. In a teaching career spanning nigh on three decades, I very seldom encounter a pianist with near enough perfect deployment of the body. A number of pianists have arrived at my door, prodigiously talented, but suffering great pain deriving from some of the aforementioned physical afflictions. These pianists could only play with the aid of cortisone injections (something I would strongly advise against) while others had been medically advised to undergo surgery. When I told them they could be cured by the use of simple keyboard exercises I had devised for the purpose, they expressed skepticism at the idea - however, they became overjoyed when after a relatively short period they were completely cured. My colleague Carola Grindea experienced similar situations with numerous musicians, and as a result founded ISSTIP, the International Society for the Study of Tension in Performance. Every instrumental teacher ought to be able to help students overcome the various physical afflictions mentioned above. All that is required is common sense, a real understanding of the human body and the psyche of the individual candidate. This will prevent instrumentalists resorting to cortisone injections, or worse, undergoing in many cases unnecessary operations. If children were trained to use their body correctly from the beginning and were not told such ridiculous untruths as ´You must play the piano as if you are holding an apple in the palm of your hand´ or ´Use your fingers pretending they are little hammers,´ they would not so often develop all those dread ailments that afflict them in later life. To return to the masters of the keyboard Mendelssohn, Chopin, Horowitz, Cortot and Haskil, to name but a few, all played with elongated fingers, manipulating the keys, instead of lifting the fingers to hit the keys from above. A correct articulation depends solely on the speed with which the key is released, and not how high you lift a finger. Piano playing requires tension; to produce this tension, paradoxically, we cannot allow ourselves to be tense. The correct breathing (you exhale when you utter a word! ), posture at the piano, the height of the piano stool (the keyboard should be in line with your elbow; do not sit any higher! ), the correct deployment of the fingers, hands and arms, a shoulder, wrist and thumb at all times free, elliptical movement (mostly clockwise for the left hand, anti-clockwise for the right hand) are all essential requirements for correct playing a beautiful singing tone and a virtuoso technique (of course, also depending largely on your imagination and capacity to hear!) . In the martial arts, use should be made of the opponents indwelling energy, in order to win over him. In the case of the pianist, we have no need to battle with the keyboard, but rather attempt to utilise to the full its inherent energy. Often it can be likened to throwing a flat stone across the water as it ricochets over and over again. So, the correct posture at the keyboard and the correct use of the body while playing is the most essential basis for piano playing - truly a prerequisite for the health of both pianist and music. JULY/AUGUST 1997 PIANO page 9ff.